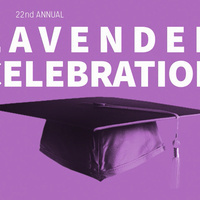 Lavender Celebration (commonly known as Lavender) is a free LGBT and ally annual graduation ceremony for undergraduate and graduate/professional students. Lavender honors students and commemorates their contributions to the University community. Graduates and scholarship recipients from the Lambda LGBT Alumni Association are recognized. Lavender also recognizes undergraduate and graduate student leaders and faculty/staff members with leadership awards. Following the celebration is a student reception with food and refreshments for everyone.